The special formula of breast milk provides your baby with all the important nutrients for a healthy development. Therefore, nursing is best for baby. Our new Novala PRE Formula has been specially designed to meet the needs of newborns and supports a healthy development from the very beginning. 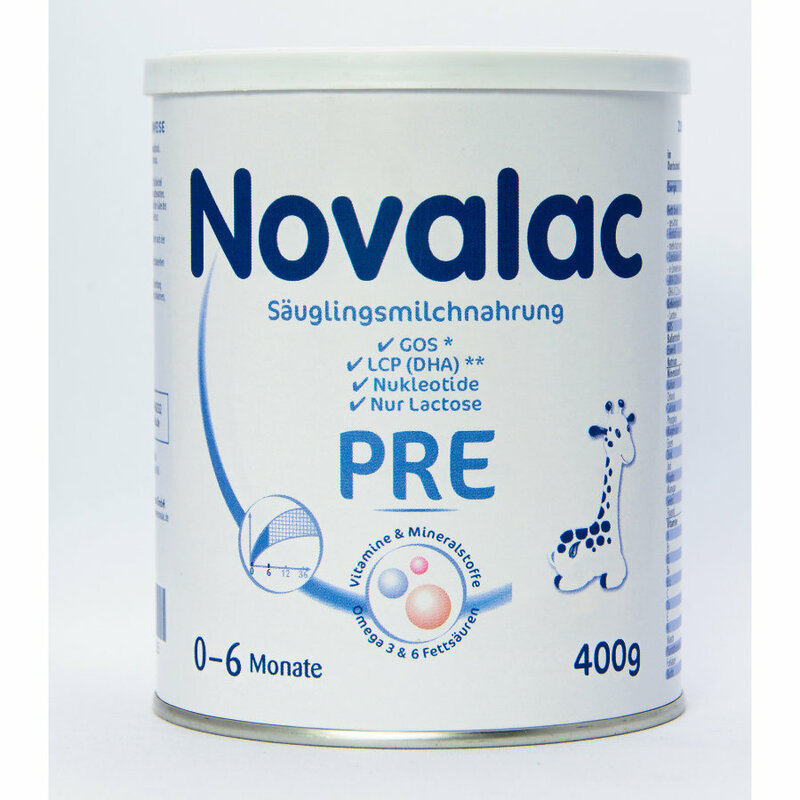 Novalac PRE only contains natural lactose and no other carbohydrates such as starch - just like breast milk. Give Novalac PRE as often as you would breastfeed your baby and according to their individual need. Novalac PRE contains important long-chain polyunsaturated fatty acids (LCP) that support the visual and cognitive development and the immune system of your baby. LCPs are especially important during the first months of life because babies are not yet able to build them on their own. Novalac PRE also contains valuable prebiotics (GOS, galacto oligosaccharides) that support the intestinal flora. 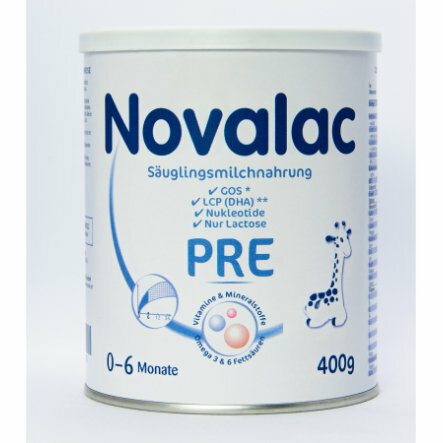 Novalac Pre is suitable from birth as sole food or supplementary food. For your baby's health, it is important to follow the instructions for a hygienic preparation. 1: Wash your hands before preparing formula. Prepare a new bottle for each meal. Clean the bottle and teat and sterilise in boiling water for 10 minutes. Boil tap water for 5 minutes and let cool to 40°C. Alternatively heat low-carbonated mineral water to 40°C max. Fill the bottle with the required amount of water. 2: Add required amount of Novalac with a measuring spoon. Please only use the measuring spoon included in the box. 3: Close the bottle and shake until the powder is completely dissolved. 4: Check the temperature (37°C) at the inside of the wrist. Feed immediately and finish within one hour. Do not reheat leftovers. skimmed milk poweder, partly demineralised whey powder (from milk)*, vegetable oils (palm, rapeseed, palm kernel and sunflower oil), lactose (from milk), galacto oligosaccharides (from milk), potassium citrate, fish oil, calcium carbonate, single cell oil, magnesium chloride, vitamins (A, B1, B6, C, D, E, K1, biotin, folic acid, niacin, pantothenic acid), sodium citrate, calcium phosphate, sodium chloride, potassium chloride, taurine, choline bitartartrate, iron sulphate, nucleotides (sodium salts of cytidine, uridine, adenosine, guanosine, inosine 5-monophosphates), zinc sulphate, antioxidants (ascorbyl palmitate, tocopherols), potassium iodide, sodium selenite, copper sulphate, manganese sulphate. * the protein in Novalac PRE is cow's milk.